No Talking Heads concert was complete without a copious amount of gray clothing, zany backup dancers, and David Byrne strutting around the stage, bobbing his head like there’s no tomorrow. In fact, the eccentric frontman set the tone with his quirky behavior for years to come. Even today, his influence on popular music can be seen—just last year, pop icon Selena Gomez sampled Talking Heads’ classic “Psycho Killer” for her song “Bad Liar”. But this repurposing doesn’t bother Byrne—at this stage in his career, it's all about regeneration and the pursuit of something fresh and new. That’s why you won’t hear him putting together a Talking Heads reunion anytime soon—he’s on his own journey now, and he’s got something new to say. The legendary art-rock frontman’s resurgence into the public eye, following multiple collaborations with the ever-fabulous St. Vincent over the past few years, has been in preparation for his latest album, American Utopia. The LP hit shelves last Friday, and according to sources, his upcoming tour will feature a decade-spanning setlist. The self-proclaimed "ambitious" tour kicks off in March, so we’ve compiled some of Byrne’s best/weirdest/most lovable live performances to get you pumped! He’ll be hitting stages along North America, South America, and playing Coachella before the tour heads off to Europe in June! 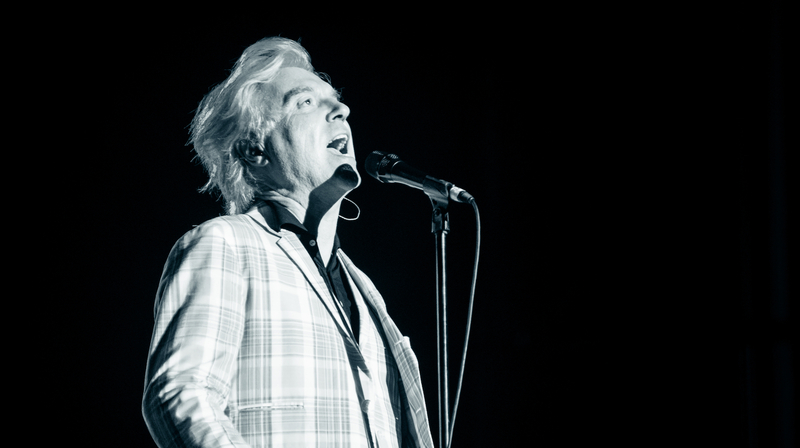 Make sure to track the icon on Bandsintown to stay in-the-know on all-things David Byrne. This is a classic Talking Heads moment, equipped with props, costumes, and a very young David Byrne. It’s also one of our favorite sets of all time! The quintessential performance from the 1984 Stop Making Sense tour - palpable energy, choreographed moves, and backup dancers that just won’t quit! Amazing. One of many electric performances from this duo, who created the album Love This Giant together in 2012. Their voices and attitudes complement each other perfectly in this clip. One of the more recent clips of Byrne from a performance he did in Austin, Texas last year. One of the most poignant and important of his songs - and he still absolutely kills it! A rare moment from 2002, when Talking Heads performed at the inductions to the Rock and Roll Hall of Fame.